It’s National Knit a Sweater in a Month (NaKniSweMo)! Danie is knitting Mama Vertebrae and Susie is knitting Water and Stone. The 2014 Legend-Prairie contest thread is open! Tell us about your most legend-prairie project of the year! Danie finished some big kid mittens. Susie finished her Barley hat. Danie worked on her My First Stitches Socks, and loves the fit of the Sweet Tomato Heel. She finds it fits her heel very well, and the pattern easy to memorize. She started a new pair of socks, her Swirling Rainbow Socks, out of fabulous yarn she dyed herself. She also worked on her Mama Vertebrae, and started another pair of kid mittens. Susie worked on her Water and Stone, and she’s past the bust shaping and is cruising down the body. She also worked on her Conjunction Cowl and John Huston socks. She too cast on a new pair of socks, using the amazing electric rainbow yarn Danie dyed. 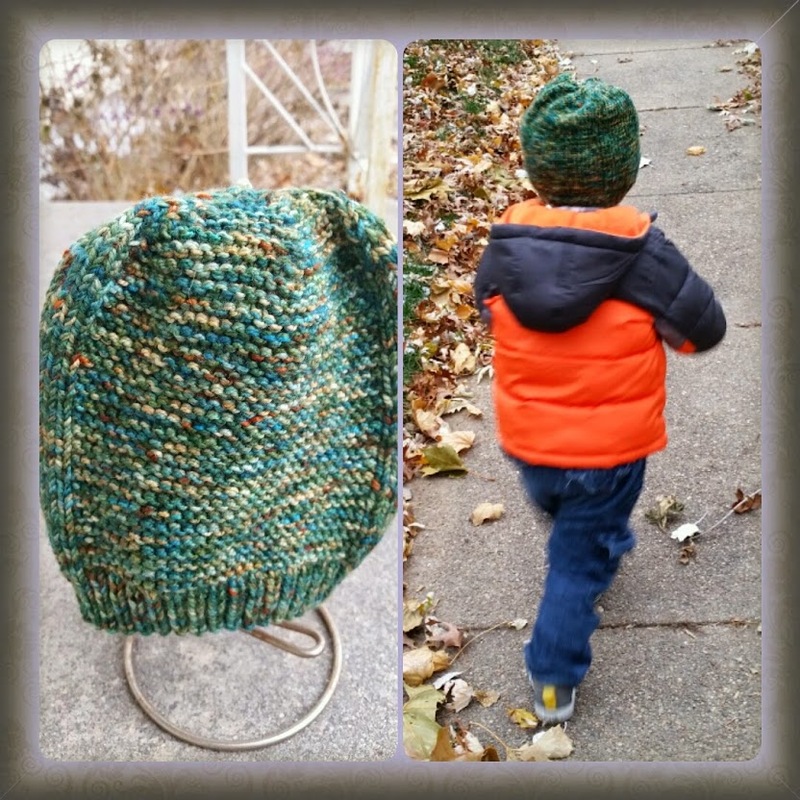 In this episode, the girls talk about their strategies for using variegated yarn. Susie declares sport is the new sock for her, and Danie concentrates on her sweater. Last week’s topic was inspired by a listener’s comment in the Episode 52 thread, and she let us know the idea originated with Em of the Knitting Pretty podcast. Check out her Ravelry group for additional discussion on the many faces of knitters. Susie worked on her Water and Stone. She’s planning on shortening it, and is winging the sizing, so she’s hoping for the best. 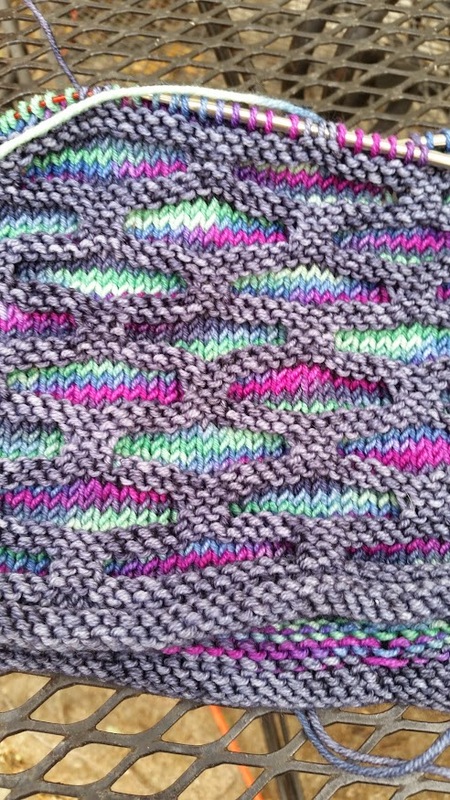 She also cast on a new Conjunction Cowl, using some fantastic Kirbywirby sport weight yarn. Danie worked on her My First Stitches Socks, and is planning to do Cat Bordhi’s Sweet Tomato Heel. She also worked on her Mama Vertebrae. Susie is planning on a Barley hat, using The Flying Kettle’s Glider in Wild Things held double. In this episode, the girls talk about the many faces of knitters. Danie won at yarn chicken, and Susie didn’t attempt it. Miscellaneous projects mentioned include Susie’s Simple Skyp socks and Grenadine and Danie’s Entangled Vines and Zigzagular Socks. The Chill Chaser KAL is going on September 1, 2014 through October 31, 2014. Check out this blog post for details! Here is a link to the official KAL thread on the Friends of Spud & Chloe Ravelry group, and a link to the KAL thread on the PGK&S Ravelry group. National Knit a Sweater in a Month (NaKniSweMo) is coming up in November. Danie is knitting Mama Vertebrae and Susie is knitting Water and Stone. The 2014 Legend-Prairie contest thread will be opening shortly! Tell us about your most legend-prairie project of the year! 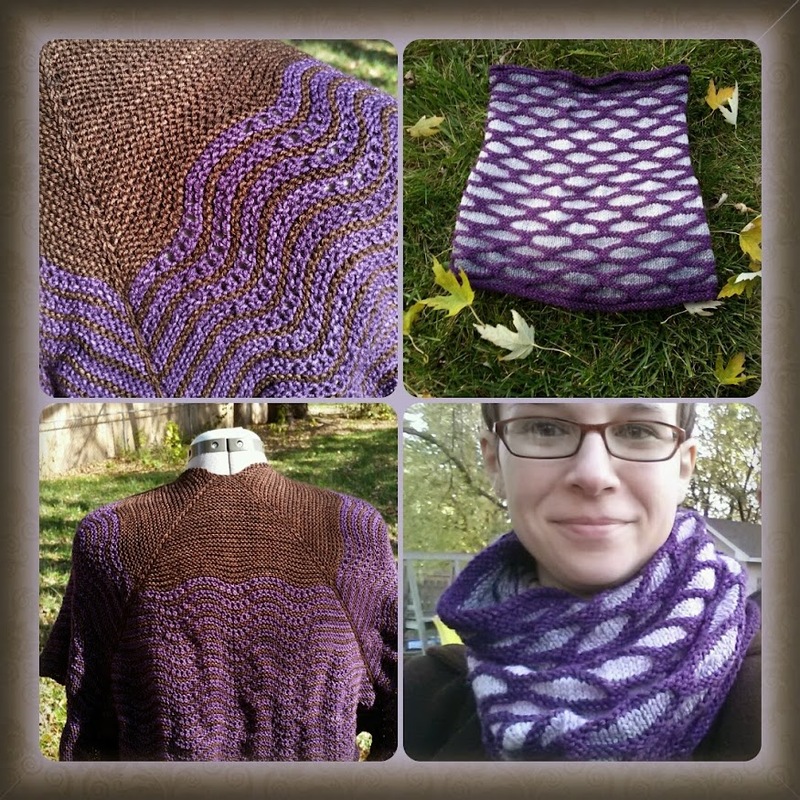 Danie finished her Conjunction Cowl. She fought the yarn chicken, and she won but it was really close. Susie finally finished her 3/4 Hap Shawl. She didn’t attempt yarn chicken, and so modified the bottom edging accordingly. Susie knit a few stitches on her John Huston, the Tarnished Hero socks. Danie cast on her My First Stitches Socks, and swatched for a Mama Vertebrae. Danie is hard on things. Tagged contest, events, NaKniSweMo2014, truth.